EAST HARTFORD – An emergency response vehicle was struck in the rear by a high-speeding car on Saturday, Feb. 14 while parked on the left shoulder to provide assistance to a car stuck on a guard rail. 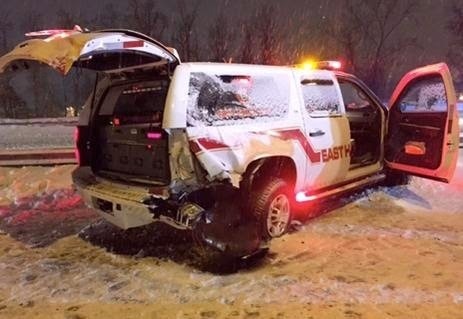 The emergency response vehicle, a 2009 Chevrolet Suburban, had just come from assisting on a car accident on Route 2 East, exit 5b with three other emergency response vehicles, and had stopped on the way back to the fire station upon discovering another accident at exit 5a. The accident in question was a car stuck on the center median guard rail separating east bound and west bound traffic. The emergency response vehicle, occupied by the Deputy Chief and the apparatus operator, parked on the left should with all warning devices activated. After checking on the driver in the car stuck on the guard rail, the apparatus operator was returning to the emergency response vehicle when it was rear-ended by a vehicle traveling at a high rate of speed. The Deputy Chief called for additional resources, and he and his driver, though injured, went to check on the occupants of the car that hit them. All parties were transported to the hospital for evaluation. The Deputy Chief and apparatus operator were treated and released, although the 2009 Chevrolet Suburban suffered significant damage and is likely totaled. Quote from Chief Oates: “The accident is a brutal reminder of the risks faced by firefighters, police officers, EMS workers, and public works/highway workers every single day as they operate on the roadway. I am thankful Rick and Lee were not severely injured. We remind the public to slow down during bad weather and reduce their speed as they approach emergency vehicles working on the highway”.